Zambia is home to over 240 large and small species of mammals. From the world’s largest land mammal – the African elephant (Loxodonta africana), and the world’s tallest – the giraffe (Giraffa camelopardalis) to Africa’s smallest mammal – the Pygmy Mouse (Mus minutoides). Mammals are animals that belong to the class Mammalia – this includes rodents, bats, monkeys, cats and dogs. They are all warm-blooded vertebrates that have hair or fur and most mammals give birth to live young which are then suckled. Until recently it was thought that the giraffe in South Luangwa National Park were a subspecies, called Thornicroft Giraffe (G. c. thornicrofti), but it was recently discovered that they are genetically identical with Masai Giraffe (G. tippelskirchi) which are found in East Africa. Although they are not a sub-species, they are important as they are a unique isolated population of Maasi giraffe belonging to the same species which live hundreds of kilometres down the Rift Valley in southern Kenya and Tanzania. In forests and wooded areas live bushbuck (Tragelaphus scriptus), bushpig (Potamochoerus larvatus), Greater kudu (Tragelaphus strepsiceros), roan antelope (Hippotragus equinus), and the huge Sable Antelope (Hippotragus niger). Smaller antelope, such as duiker are harder to spot, as they live in dense thickets. Zambia has four species: Common Duiker (Sylvicapra grimmia), Blue Duiker (Cephalophus monticola), Yellow-backed Duiker (Cephalophus silvicultor) and Red Forest Duiker (Cephalophus natalensis). 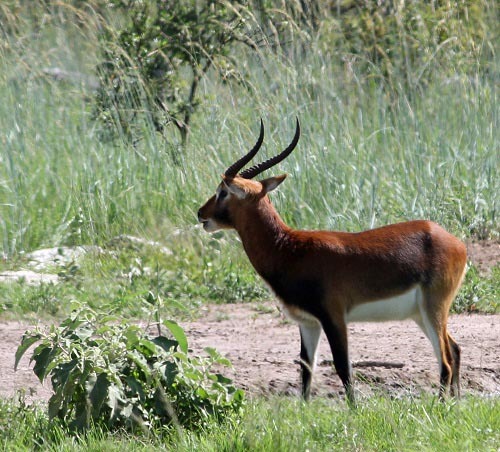 Other small antelope, such as Sharpe’s Grysbok (Raphicerus sharpei) and Steinbok (Raphicerus campestris) can sometimes be spotted on the fringes of the woodlands in thicketed areas. Africa’s largest antelope – Eland (Tragelaphus oryx) – can be found in open woodland areas. Eland are 1.5m tall at the shoulder and can weigh up to 700kg. They are renowned for being able to jump up to 3m from standing still. Vervet monkeys (Chlorocebus pygerythrus) are commonly seen in woodlands, foraging and playing in large troops. Blue Monkeys (Cercopithecus mitis) are harder to find as they prefer living in forests and can be found in Kasanka and Lavushi Manda National Parks along with Kinda Baboons (Papio kindae). Yellow Baboons (Papio cynocephalus) prefer more open woodlands and they can be found in the Luangwa Valley. 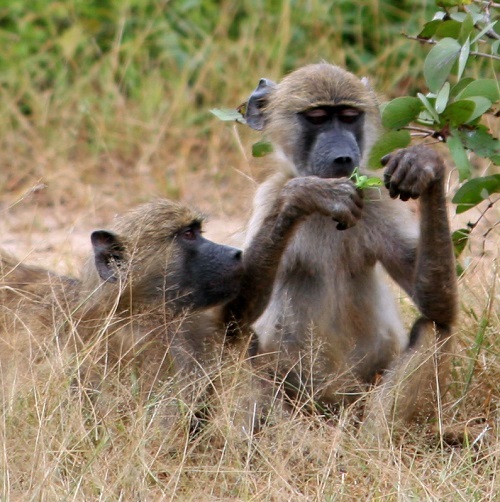 Whereas troops of Chacma Baboon (Papio ursinus) can be found in Kafue and Lower Zambezi National Parks. Side-striped jackal (Canis adustus) are mainly nocturnal, preferring to spend their days in their woodland burrows and hunting and scavenging in more open areas at night. Forty years ago Zambia had the third largest population of Black Rhino (Diceros bicornis) in Africa, but they became extinct by the 1980s. Recently black rhinos have been re-introduced into the country, and there is a breeding program for these woodland dwelling browsers in The North Luangwa Region. On the surrounding grasslands you can find many of the more typical ‘plains animals’, such as herds of impala (Aepyceros melampus) living alongside Blue Wildebeest (Connochaetes taurinus). 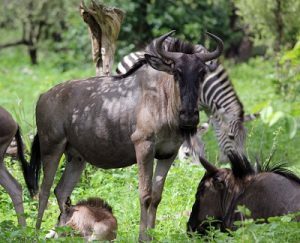 The Cookson’s Wildebeest (Connochaetes taurinus cooksoni) is a subspecies which is larger and has straighter horns and these can be found in South Luangwa National Park. They often associate with zebra and Zambia has two species – Burchill’s zebra (Equus quagga burchellii) which can be commonly found, and Crawshay’s zebra (Equus quagga crawshaii) which only live east of the Luangwa River. Smaller antelope, such as the graceful Oribi (Ourebia ourebi) can also be seen in pairs in more open grasslands. Giraffe roam the grasslands, and Zambia is home to two sub-species: Angolan Giraffe (Giraffa giraffa angolensis) which were common in south-western Zambia and can now be found in Mosi-au-Tunya and Lusaka National Parks. The smaller Maasi Giraffe (Giraffa camelopardalis tippelskirchi), which until recently was thought to be a separate sub-species called Thornicroft, can be found in the Luangwa Valley. Herds of African elephant (Loxodonta africana) are found in Parks across the Country, either in matriarchal groups of related females with their young, with males associating in smaller bachelor herds or living on their own. They are both grazers and browsers and can be seen on open grasslands, browsing in nearby woodlands or drinking and playing in the rivers. The ox-like Cape buffalo (Syncerus caffer) are also found in both woodlands and grazing on the grasslands. Large herds are often seen when they are most active in the early mornings and late afternoons, or when they are resting in the shade during the heat of the day. Huge male warthog (Phacochoerus africanus) and their families can be found enjoying mud bathing and feeding on their knees in dambos and trotting along with their tails up in the grasslands. 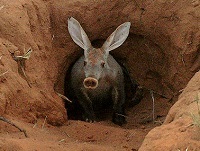 If startled they will run into the nearest burrow which they then enter backwards. 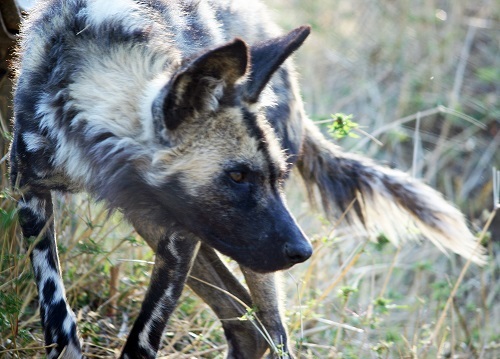 Living amongst these grazers are the larger carnivores – African Wild Dog (Lycaon pictus pictus), lion (Panthera leo) and leopard (Panthera pardus). The cheetah (Acinonyx jubatus) is the fastest land mammal and can often be seen resting high up on termite mounds in Kafue National Park. Spotted hyena (Crocuta crocuta) have a very distinctive ‘whooping’ call and hunt in clans in more open areas. Southern White Rhino (Ceratotherium simum simum) were poached to extinction in the 1980s, but have since been re-introduced. You can find them grazing on the grasslands in Mosi-au-Tunya and Lusaka National Parks. Along the shores of the rivers live herds of Puku (Kobus vardonii). 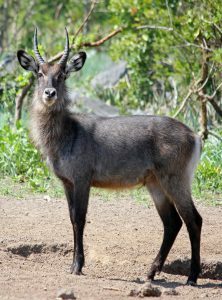 Close to permanent water in the lowland Luangwa and Zambezi valleys you will find Common Waterbuck (Kobus ellipsiprymnus) which have the white ‘target’ circle on their hind end. 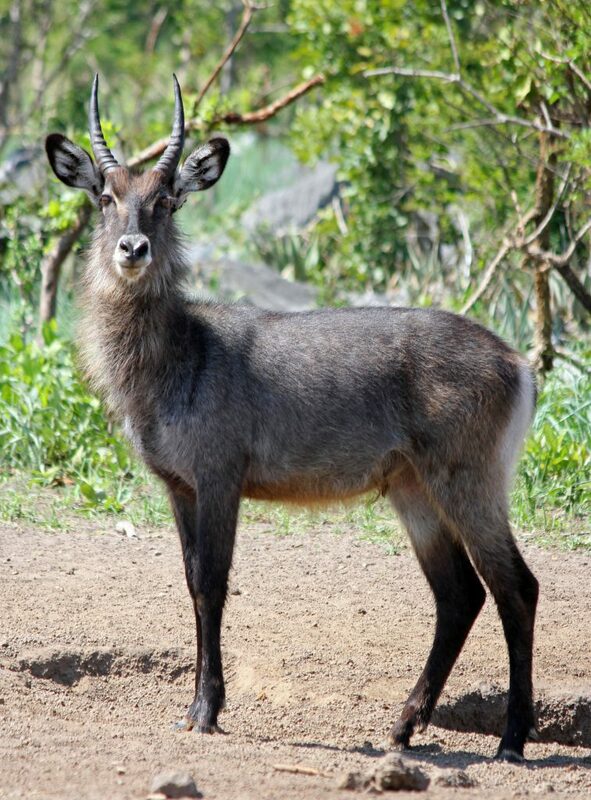 Whereas Defassa waterbuck (Kobus ellipsiprymnus defessa), which has a ‘circular’ white patch on their hind end, is found in Parks in the rest of the country. Also close to water you will find Lichenstein’s Hartebeest (Alcelaphus lichtensteinii), Reedbuck (Redunca arundinum) and the shy swamp dwelling Sitatunga (Tragelaphus spekii). 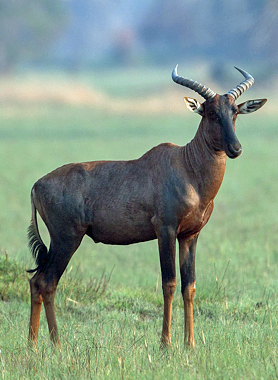 The rare Black Lechwe (Kobus leche smithemani) and Bangweulu Tssesbe (Damaliscus lunatus superstes) live around Lake Bangweulu, with the endemic Kafue Lechwe (Kobus leche kafuensis) living on the Kafue Flats and Red Lechwe (Kobus leche) are found in Kafue National Park. 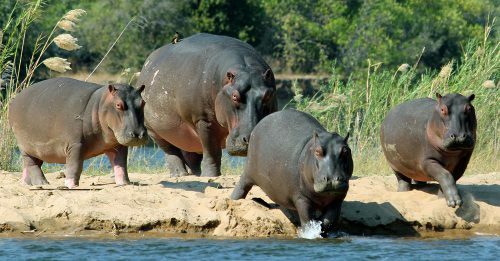 Zambia’s many rivers and lakes are home to huge populations of hippopotamus (Hippopotamus amphibius). It is estimated that we have about 40,000 individuals living around the Country. Other water loving mammals are otters which hunt our diverse species of fish. Zambia is home to both the African Clawless (Aonyx capensis) and the Spotted-necked Otter (Hydrictis maculicollis). Many animals visit the rivers during the cooler parts of the day to drink and to cool down, such as elephants, water loving antelope and zebra. Carnivores can also be spotted hunting at the edge of the rivers and drinking from watering holes, especially in the dry season. In the dryer, rocky areas you might spot Klipspinger (Oreotragus oreotragus) in the Luangwa region and on the mountains at Lavushi Manda National Park. Rock Dassie or Hyrax (Procavia capensis) can often be seen ‘sun bathing’ on rocks to warm up in colder weather and Zambia is also home to Southern Tree Hyrax (Dendrohyrax arboreus) and Bush or Yellow-spotted Hyrax (Heterohyrax brucei). Many smaller mammals are mainly nocturnal, such as the Lesser Bushbaby or Nightape (Galago moholi) and the larger Thick-tailed Bushbaby (Otolemur crassicaudatus) which can be seen jumping from branch to branch in tall trees. Honey Badgers (Mellivora capensis) are more commonly seen with their characteristic rolling gait, their head down, in search of prey. African Civet (Civettictis civetta) are solitary and also move with their heads kept low, hunting for food, which includes smaller mammals, birds, reptiles, insects and fruit. Porcupine (Hystrix africaeustralis) are the largest of the rodent family and are unmistakable with their black and white quills and spines. 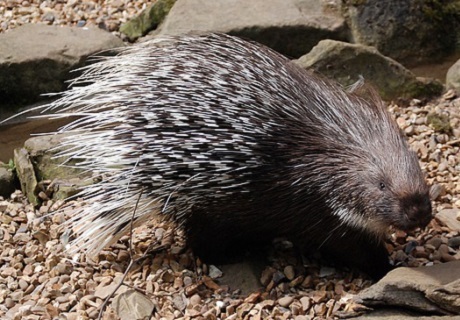 When threatened they will aggressively charge backwards, trying to impale their attacker with their sharp quills. 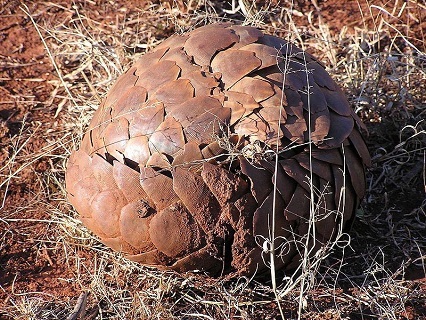 One of the rarest and most endangered nocturnal mammals is the Pangolin and Zambia is home to both the Ground Pangolin (Manis temminckii) and the larger White-bellied or Tree Pangolin (Phataginus tricuspis). Caracal (Felis caracal) prefer drier woodland habits and are known for being able to jump three meters into the air to catch guinea-fowl and other birds. They also prey on rodents, hares and even small antelope, and unlike other small cats they can kill prey larger than themselves. 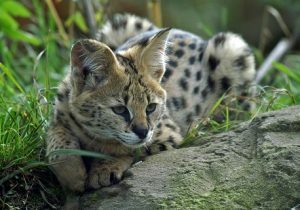 Serval (Felis serval) prefer watery grass habitats, and can be found in reed beds and riparian forests. They hunt at night on smaller mammals, birds, reptiles and fish by using echo location to pick up the vibrations of their prey. They have the longest legs, in relation to body size, of all the African cats. The African wild cat (Felis silvestris) is the ancestor of the domestic cat. They are solitary and secretive, hiding in dense cover during the day and are very active at night hunting small mammals, birds, reptiles and insects. Other harder to spot nocturnal mammals include the Aardvark or Antbear (Orycteropus afer), the shy Aardwolf (Proteles cristata), Angolan Genet (Genetta angolensis), Large-spotted genet (Genetta tigrina), Small-spotted genet (Genneta genetta), Rusty-spotted genet (Genetta rubignosa) and the Zorilla or Striped polecat (Ictonyx striatus). Zambia is home to nine species of mongoose. Banded (Mungos mungo) and Dwarf Mongoose (Helogale parvula) are the most social speices, and can be seen foraging in large groups. The less social mongoose species are the Large grey (Herpestes ichneumon), Slender (Galerella sanguinea), Meller’s (Rhynchogale melleri), Selous (Paracynictus selousi), White-tailed (Ichneumia albicauda) and Bushy-tailed (Bdeogale crassicauda). Marsh or water mongoose (Atilaz pauludinosis) are excellent swimmers. They throw crabs and snails against rocks in order to break open the shells to eat the tasty meat inside. Rodents, or Rodentia, are the largest ‘order’ of small mammals. 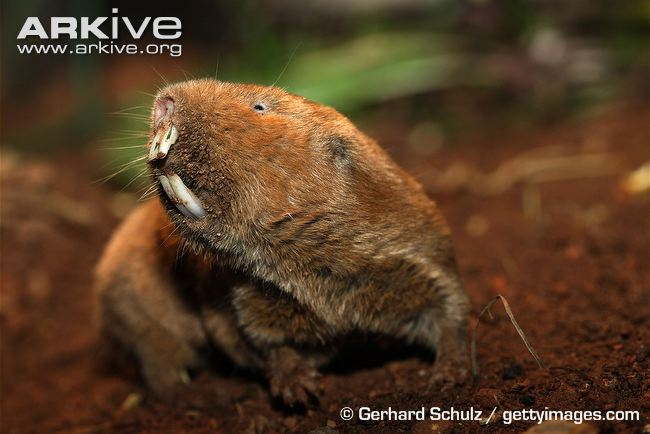 This ‘order’ includes rats, mice, mole-rats and squirrels which all have a characteristic pair of large chisel-like incisor teeth. Rodents can vary in size from – the 20 kg porcupine to the tiny Pygmy mouse which weighs just 12 grams. Bats belong to the ‘order’ Chiroptera. This ‘order’ is the most ecologically diverse of all the mammal groups. Bats are flying mammals and are the only ones that are capable of continuous flight. Over seventy different species and sub-species of bat are known to live, or visit, Zambia. Twelve of the species are fruit bats, which feed on fruits and nectar. They do not use echolocation, but rely on their acute vision, having large eyes and an excellent sense of smell. They are normally larger then insect-eating bats, with long-muzzle or dog-like faces, and they have two claws on each wing. Fruit eating bats have simple teeth with no well-developed cusp pattern. They have small or no tails. Our most famous is the African straw-coloured fruit bat (Eidolon helvum). Millions gather in a small evergreen swamp forest within Kasanka National Park each year. 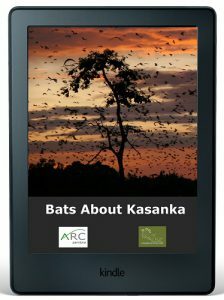 There are thought be to be over 10 million bats which arrive in Kasanka in October and sometimes stay until January, making it the largest mammal migration in the world. Insect eating (insectivorous) bats use echolocation to locate their prey by emitting ultrasound pulses, then listening to the returning echo. They also use this echolocation to navigate in the dark. To accurately pinpoint insects and obstacles, many bat species have large ears and an extra projection called a ‘tragus’. Nearly all insect eating bats are smaller in size than fruit bats and they have a single claw on each wing. Their teeth have sharp cusps, usually in a W pattern, for chopping up their insect prey. Zambia is thought to have 61 different species and sub-species of insectivorous bats. They can eat up to 1,200 insects, including mosquitoes, every hour and some consume their body weight in insects every night. This helps to keep insect populations in check, and is thought to be an an important natural pest control for our crops and agriculture and for our health. We have not included any of the ‘exotic’ mammal species that have been introduced into Zambia, such as the Nyala (Tragelaphus angasii) or the Axis Deer (Axis Axis) that now live in Lusaka National Park. 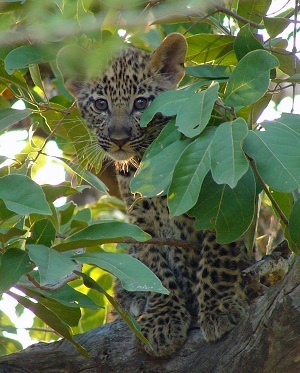 If you know of any mammal that live or visit Zambia that is not on our list then please contact us.